In October 2017, Mayor Muriel Bowser designated the Lower Georgia Avenue Main Street (LGMS) program to serve the commercial corridor between Barry Place and Kansas Avenue along Georgia Avenue in Wards 1 & 4. The LGAMS grant was awarded through the Department of Small and Local Business Development (DSLBD) to revitalize communities by retaining and recruiting businesses, improving commercial properties and streetscapes, and attracting consumers. It serves as a community-based economic development program, and connects local businesses to the assistance and resources they need to adapt to and thrive in changing local environments. With the leadership and support of community volunteers, LGAMS plans local events and promotions that draw people to shop, play, learn, dine and build meaningful relationships in this vibrant community. LGAMS activities take place in the historic neighborhoods of Pleasant Plains, Park View and Petworth. 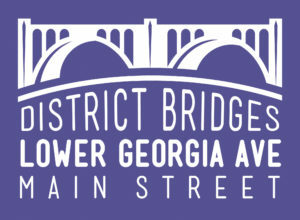 To ensure the needs and values of the neighborhood are represented, District Bridges developed the Lower Georgia Avenue Neighborhood Strategy Council (LGA NSC). The LGAMS is made up of local business owners, key institution representatives, and community leaders. The LGA NSC advocates on behalf of neighborhood priorities for community-based economic development and seeks to enrich neighborhood vitality through supporting local businesses and engaging the community.